I should be thinking about springtime and cherry blossoms and picnics, but instead of sunshine, today Vancouver was covered in that ol’ familiar cloud cover. Go away, grey, we’re sick of your drab! Maybe I should have searched the local markets for fresh asparagus to help lift my spirits, but instead I wallowed. And made soup. A hearty, wintery fare suitable for comforting long nights like your favorite worn sweater. So what if spring is on the doorstep, today I took the greyness and marched with it. This soup is comfort through and through. The key to the flavour of this soup is the mustard. I used my favorite dill mustard, but I’m sure dijon along with a drop of honey to mellow it out would work just as nicely. In a large pot, saute the garlic and onion until translucent. 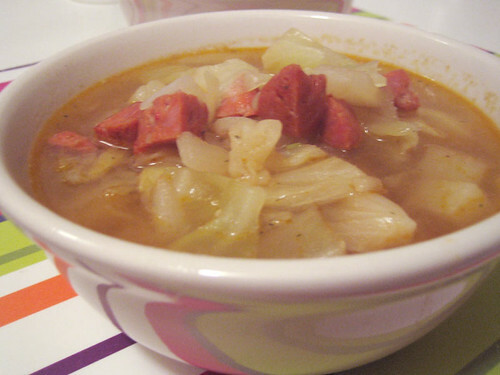 Add in the chorizo, potato and cabbage and mix about until the cabbage gets wilty. Cover with water and add in the stock cubes, thyme and chili. Bring to a boil and then simmer for about 30 minutes to 40 minutes. Throw in a large dollop of mustard and stir to combine. Add salt and pepper to taste. Serve in bowls topped with sour cream. I’ll take grey clouds over snow anyday. I woke up this morning to a blanket of snow covering good ol’ T.O. There’s more on the way…damn! Looks to be a good way to combat a very wonky season. wow, joanne and meena, i’m shocked that you have snow! that is just plain crazy. and here i was complaining about a little cloud cover and the threat of rain! today is all sunshine and lollipops here! maybe spring will stick for good. s’kat, it’s been a long winter and definitely wonky, but i’m keeping my fingers crossed that spring will come soon! Wow. I just read the name of the recipe and was ready to eat it. What a delicious sounding soup. Regarding the beef stock cubes, have you tried the Better Than Bouillon stock bases? A teaspoon in boiling water makes a cup of rich, savory stock. It comes in many flavors, including beef. The one I use most is mushroom–it flavors sauces nicely without making them taste like soup [although this recipe being soup, tasting like it is actually a good thing]. And regarding the weather, no kidding. We’re freezing our butts off in Chicago today. Somehow they always grow back, though. I wish I could like Chorizo, but something about “salivary glands” on the label just sounds aweful. What brand do you buy? terryb, i just use cubes because that’s what i had…plus i’m a bit of a cheapskate! lisa, i’ve never seen “salivary glands” on a package of ingredients…but then again, i usually buy just 1 link from the butcher and there’s no packaging and list of ingredients. The addition of the tangy mustard, (I used French’s prepared) with some maple syrup and fresh dill, added so much flavour to the cabbage. I omitted the potatoes since my husband does not like potatoes in soup; and instead of chorizo sausage, I added some chunks of pork belly bacon. Despite these small alterations this soup was so flavourful; it also took the chill out of an otherwise wintery Easter weekend. joanne, so glad you loved the soup! yikes, lisa, that does sound scary. i’m afraid that i’ll now think of salivary glands when i eat chorizo! Yuk, salivary glands, no more chorizo for me! just made this and it is delicious! thankyou for such a different, cheap, and yummy soup recipe!